For journalists, researchers and the general public, the Centers for Disease Control and Prevention serves as an authoritative source of information about Americans’ health, including estimates of how many people are killed or injured by guns. The agency’s most recent figures include a worrying uptick: Between 2015 and 2016, the number of Americans nonfatally injured by a firearm jumped by 37 percent, rising from about 85,000 to more than 116,000. It was the largest single-year increase recorded in more than 15 years. 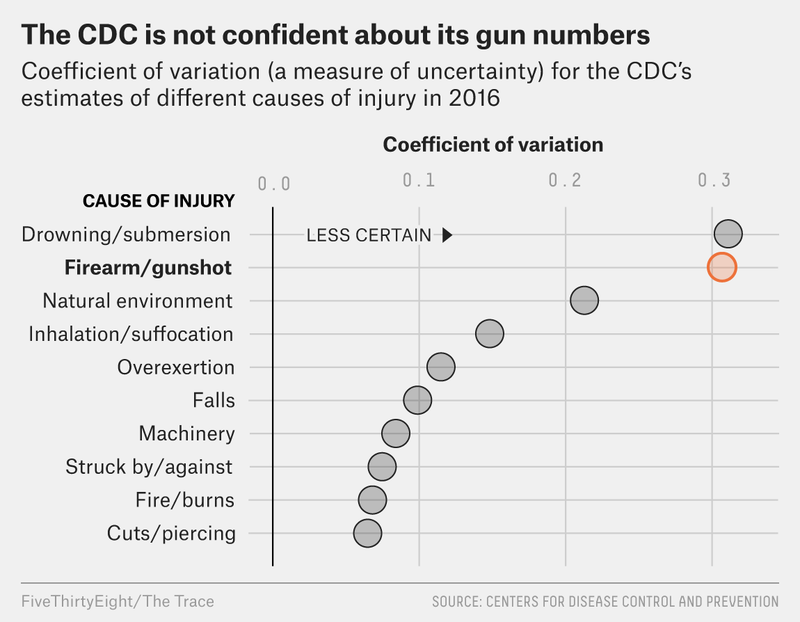 But the gun injury estimate is one of several categories of CDC data flagged with an asterisk indicating that, according to the agency’s own standards, it should be treated as “unstable and potentially unreliable.” In fact, the agency’s 2016 estimate of gun injuries is more uncertain than nearly every other type of injury it tracks. Even its estimates of BB gun injuries are more reliable than its calculations for the number of Americans wounded by actual guns. An analysis performed by FiveThirtyEight and The Trace, a nonprofit news organization covering gun violence in America,1 found that the CDC’s report of a steady increase in nonfatal gun injuries is out of step with a downward trend we found using data from multiple independent public health and criminal justice databases. That casts doubt on the CDC’s figures and the narrative suggested by the way those numbers have changed over time. Over a dozen public health researchers reviewed The Trace and FiveThirtyEight’s analysis and said that the inaccuracy of the CDC gun injury data has serious implications for the national-level understanding of gun violence. “No one should trust the CDC’s nonfatal firearm injury point estimates,” said David Hemenway, director of the Harvard Injury Control Research Center. Hunt herself cited the estimates in the introduction of a policy paper she published last year. “It feels like a gotcha moment for people who’ve used it,” she said. One likely reason that researchers frequently cite the data is that it’s easily accessible online through the CDC’s Web-based Injury Statistics Query and Reporting System, or WISQARS. Measures of the estimates’ uncertainty are also available through the system, but they are hidden by default. Kristen Moore, a professor of mathematics at the University of Michigan, recently cited the CDC’s gun injury estimates in an article for an actuarial trade publication. She was surprised to see that trends from other sources of data pointed in the opposite direction from the trend in the CDC’s data. “WISQARS is so nice and you can go there and do your own queries and you can pull the data yourself, and it has the name CDC behind it, which makes it seem so official,” she said. In order to account for the differing methodologies used to produce the estimates, we compared which way the data trended in each data set, rather than the estimated tallies themselves. If the various data sets are each accurately measuring the same underlying phenomenon, the trends should be similar; a large mismatch in the direction or slope of trend lines would indicate that one of the data sources may be using a flawed approach to data collection or estimation. The FBI and Bureau of Justice Statistics also collect data that give us another way of evaluating the CDC’s estimates. The FBI tracks gun crimes, though not injuries specifically, and the BJS tracks gun injuries by surveying crime victims. Neither of these databases include other sources of gun injuries, such as accidents or suicide attempts — but they offer another frame of comparison for the CDC’s estimates. 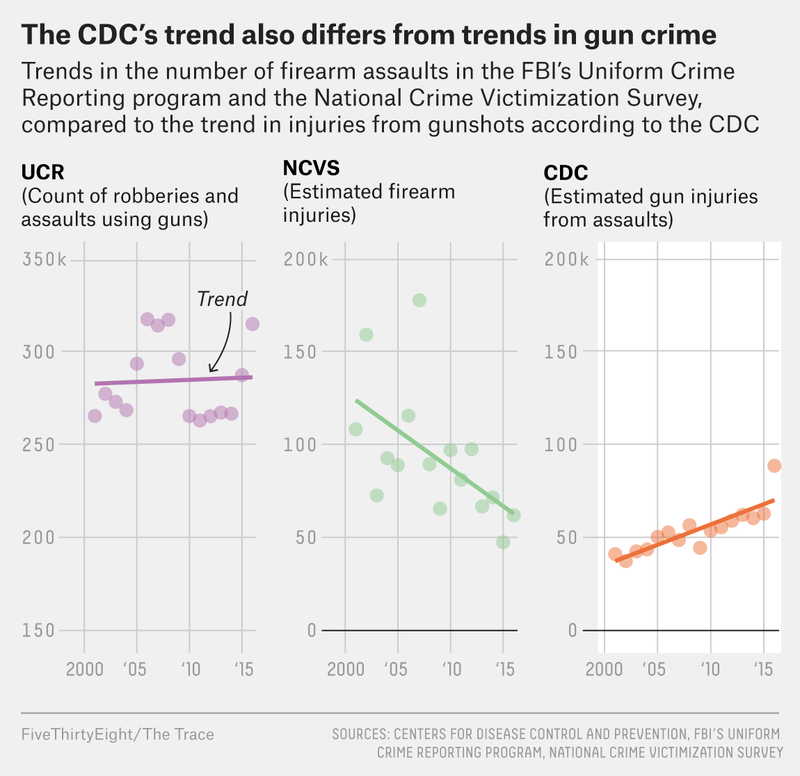 These data sets show an uptick in gun injuries and gun crime from 2015 to 2016 — which you can see by looking at the two rightmost dots on each panel of the charts below — which is similar to what the CDC shows. But here too, the multiyear trends — represented by the lines on the charts — diverge from what the CDC shows. After seeing the comparisons between the CDC’s data and other data sets, Linda DeGutis, a former director of the National Center for Injury Prevention and Control at the CDC, questioned whether the agency’s model for estimating the number of gunshot injuries nationwide is reliable. A spokesperson from the Consumer Product Safety Commission said in an email that the sample’s design “requires a more complex calculation to detect changes over time” than the type of analysis The Trace and FiveThirtyEight performed. The information to do the more complex calculation, however, is not available through WISQARS. The data source the CDC uses to generate nonfatal injury estimates may be uniquely unfit to track gunshot wounds. Unlike the agency’s fatal injury counts, which are tallied from death certificates by the CDC itself, its estimates of nonfatal injuries are derived from a survey of hospitals, known as the National Electronic Injury Surveillance System, or NEISS. The database, which is maintained by the Consumer Product Safety Commission, was originally created with the objective of tracking consumer-product-related injuries. Injury information is collected from a sample of hospitals that is designed to act as a cross-section of all the nation’s hospitals: large and small, urban and rural. What’s more, the hospital selection process fails to take into account regional variations in injuries. For many common types of injuries, such as burns and falls, this doesn’t present a problem. But some injuries, such as gunshot wounds, vary strongly by location; they tend to be intensely concentrated in certain areas and nearly absent from others. Consider two hospitals, one in a low-crime area of Manhattan and the other in an area of Chicago where gun violence is common. Both may treat a similar number of patients, but they’ll probably see vastly different numbers of gunshot victims. This variation in shooting injury volumes is a problem for statistical modeling. Because there are so few hospitals in the sample, the presence or absence of a single facility can dramatically affect the estimate. If the Manhattan hospital goes into the model, the estimate will skew lower. If the Chicago hospital is used, the estimate will be higher. The coefficient of variation for the CDC’s most recent firearm injury estimate is 30.6 percent — higher than every type of injury except drowning/submersion. (Estimates of drowning-related injuries are also vulnerable to this geography problem — one hospital near a body of water, for example, could distort the totals.) 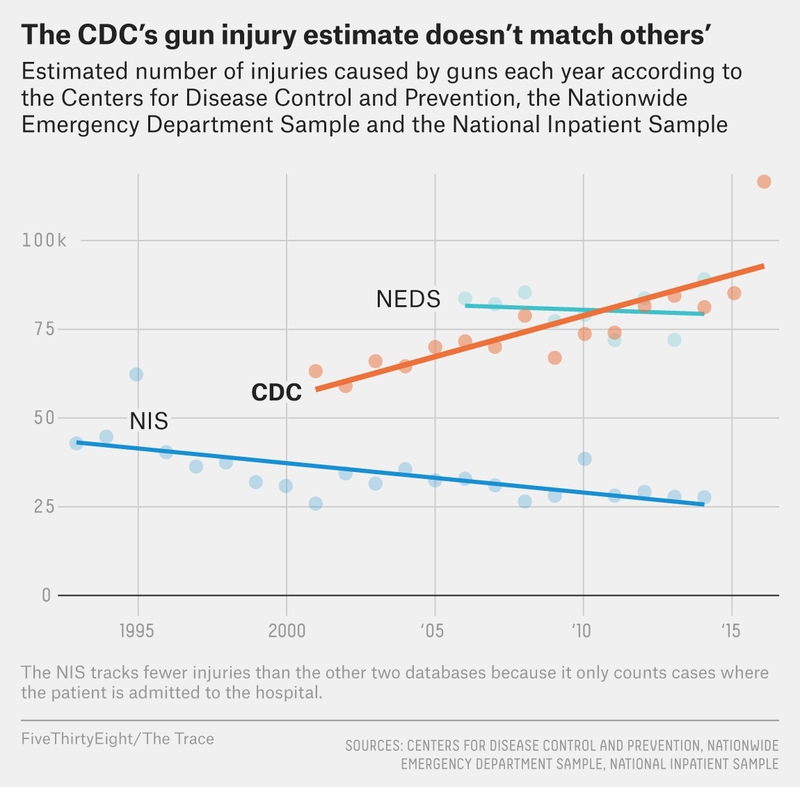 By comparison, the average coefficient of variation for gun injury estimates from the Nationwide Emergency Department Sample, a similar database that tracks visits to emergency rooms, is less than 8 percent. The Consumer Product Safety Commission did not respond to direct questions on whether its data was suitable for generating reliable estimates of the national number of gun injuries. The consensus among the researchers interviewed by The Trace and FiveThirtyEight is that the rise in the CDC’s gun injury estimate is likely caused by some hospitals in the sample treating more gun injuries than others. “If you have hospitals in communities that have a lot of firearm injuries, it’s going to change the estimates in a very significant way,” said Guohua Li, editor-in-chief of the peer-reviewed medical journal Injury Epidemiology and director of Columbia University’s Center for Injury Epidemiology and Prevention. To check this geographic hypothesis, The Trace and FiveThirtyEight filed Freedom of Information Act requests for the lists of hospitals included in the NEISS sample from 2000 to 2018. Both the CDC and the Consumer Product Safety Commission initially declined our request, the CDC on the grounds that it does not gather that data, and the consumer commission on the grounds that releasing the hospitals’ names would be a violation of patient privacy. We appealed the commission’s decision; the appeal was granted and we were told we’ll receive the full list of hospitals soon. We will analyze the data once we have it and follow up with any significant findings. For now, external research supports our suspicions. A 2017 study co-authored by Phil Cook at Duke University and published in the American Journal of Public Health established how heavily hospital selection can skew injury estimates in the NEISS. Cook said the research found that the addition of just five gun-treatment hot spots to the pool of hospitals in the CDC data accounted for much of the apparent increase in nonfatal gunshot injuries from assaults. When Cook adjusted his model to account for the distortion from these hot spots, the trend in nonfatal shootings from year to year appeared to be flat. Other databases have grappled with similar geographic distortions. In 2014, for example, federal researchers at the Agency for Healthcare Research and Quality set out to reduce the effects of geography and hospital selection in the National Inpatient Sample, a database of hospital admissions. Instead of looking at all cases from a subset of hospitals, as they had done in the past, researchers decided they should look a subset of cases from all participating hospitals. By expanding the number of hospitals included in the sample — from 1,000 to more than 4,500 — the redesigned database nearly halved its margins of error. Because the database now draws on data from most of the hospitals in the country, its estimates are no longer so susceptible to the distortions that can result from a small sample size. A study published last year by the Journal of the American Medical Association found that compared to other leading causes of death, there has been a disproportionate lack of research on gun violence. Another article in JAMA’s journal of internal medicine indicated that language in the 1996 congressional appropriations bill likely contributed to a lack of funding for gun research — that act includes a provision known as the Dickey Amendment that says CDC money may not be used to “advocate or promote gun control.” Former leaders in the CDC have said that the agency made a conscious choice to avoid firearm research rather risk political retribution. Researchers have proposed a number of potential solutions for a more reliable national estimate of nonfatal gunshot injuries. Daniel Webster, director of the Johns Hopkins Center for Gun Policy and Research, suggests expanding the FBI crime-tracking program to also track gun injuries, since many police departments are already recording this information. Kit Delgado, a professor of emergency medicine and epidemiology at the University of Pennsylvania, thinks researchers should interrogate the NEISS data and decide what the database can contribute that can’t be provided by newer systems like those maintained by the Agency for Healthcare Research and Quality. Every researcher we interviewed agreed that adding more hospitals to the CDC’s data would improve its reliability. In his work as editor-in-chief of Injury Epidemiology, Li has recently seen more manuscripts citing the Agency for Healthcare Research and Quality’s data instead of the CDC’s. This article was published in partnership with The Trace, a nonprofit news organization covering gun violence in America. Sign up for its newsletter, or follow The Trace on Facebook or Twitter. CLARIFICATION (Oct. 4, 2018, 2:52 p.m.): This article has been updated to clarify that the databases used for comparison against the CDC data are produced by a branch of the Department of Health and Human Services, the Agency for Healthcare Research and Quality. The Trace receives funding from several organizations, including Everytown for Gun Safety Support Fund, the 501(c)(3) associated with Everytown for Gun Safety, a group that promotes increased gun control measures. The president of The Trace’s board, John Feinblatt, is also the president of Everytown for Gun Safety. The types of injuries chosen are those that are the most directly comparable between the different data sources. The 10 injury types analyzed are: cuts/piercing, drowning/submersion, falls, fire/burns, firearm/gunshot, inhalation/suffocation, machinery, natural environment, overexertion and struck by/against. Specifically, we use data from the National Inpatient Sample, which contains data on hospital stays, and the Nationwide Emergency Department Sample, which contains data on visits to emergency departments. To conduct our analysis, we standardized the yearly counts for each data set and fitted a linear time trend line to each source and injury type. We then compared the slope coefficients between the CDC and the other two databases for each injury type using a standard t-test. Results are considered statistically significant if the t-test reveals a difference between trends at the 90 percent confidence level — in other words, there’s a less than 10 percent chance that our test would show a difference in trends of this size when there was really no difference. An estimate’s coefficient of variation (CV) is proportional to the square root of its variance, which is a measure of how spread out the individual data points are. In a sample where the hospitals all treat a similar number of firearm injuries, the CV of the estimate will be lower; if some hospitals treat a large number of gun injuries and some treat a small number, the CV will be higher. As of Sept. 25. The CDC made some adjustments to its uncertainty estimates while this story was being reported, but all numbers in this article reflect the most recent estimates available. Sean Campbell is a senior investigative fellow at The Trace. Daniel Nass is associate editor for data and graphics at The Trace.